Sophie Wade is the Founder and Workforce Innovation Specialist at Flexcel Network. Sophie speaks, consults, and writes as an authority on the wide-ranging Future of Work issues impacting companies and workers’ new demands—such as attracting, engaging and retaining talent; digital transformation; managing distributed workers; workplace flexibility; intergenerational communication and new career paradigms. 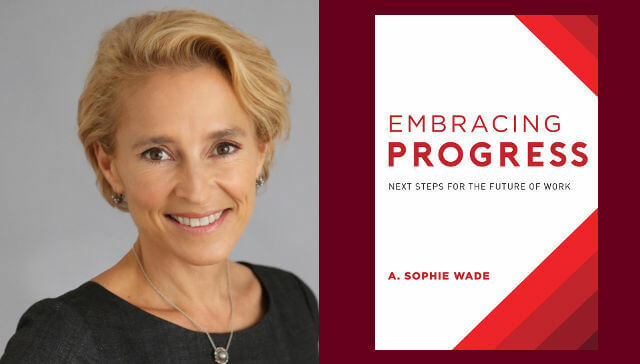 Sophie is the author of Embracing Progress: Next Steps for the Future of Work. Sophie has lived and worked in Asia, Europe and the U.S.. With a strategy and finance focus, her career has been spent assisting entrepreneurs and major corporations identify, develop and execute strategic initiatives, build teams and ventures and create partnerships. She is the 2015-17 President of the New York City chapter of the National Association of Women Business Owners (NAWBO). Sophie has a BA from Oxford University in Oriental Studies (Chinese) and an MBA from INSEAD. 1MFWF: You note that “workplace flexibility is a matter of mindset first and policy second.” What do you mean by that? Sophie: Workplace flexibility at its core means having an inclusive and adaptive approach to your talent, and an open mindset in order to be able to recognize and respect every employee as an individual. Each person has a different situation, strengths, working style (such as preferring independent versus team work), desired working profile (for example, when and where they want to work) and non-corporate obligations. Truly acknowledging every individual—and investing time and effort to accommodate and personalize their work experience—requires a corporate mindset that is flexible and empathetic. This attitude towards talent is then, secondarily, formally expressed and implemented as policies that reflect this. 1MFWF: At 1MFWF, we often talk about the fact that there’s no one size fits all when it comes to flex. You discuss that the same holds true for engagement as well. But not having a clear recipe for success can be daunting. How can companies establish exactly what their own workforces need? Sophie: Every one of us is different, with unique combinations of circumstances, needs, obligations, interests, and strengths. We are not motivated by the same things. So a variety of working models, formats and benefits will enable and support employees to perform at their best. This can certainly seem challenging. A key first step is to create a survey to gather data across the workforce to understand what their specific needs and interests might be, what motivates them and what their priorities are. Employers often dread the prospect of receiving all this feedback. In fact, employees’ asks or desires are generally far less demanding or expensive than their employer fears they are! A survey also engages employees in the process, winning their favor by asking about desires and priorities. The results can then be analyzed to see how best to accommodate employees in different ways, recognizing that the end game is higher performance and productivity. With regard to flexibility and benefits, a specific company can decide what is viable to adjust for and what might not be, at least for now. There might be options to prioritize that can be shared with employees. Workers can then participate in ranking preferences, allowing them to appreciate the desire to respond to their needs, while recognizing that choices frequently have to be made and why. In addition, technologically-advanced software and applications can now be personally-customized, permitting services and rewards to be targeted on an individual basis and in a scalable way. 1MFWF: You also warn that even employees themselves might not yet understand what their optimal work style might be. How can employers help them figure that out? Sophie: Most workers have little experience making specific choices to define their desired overall working style–how, where, when, and even what work is done. Younger workers are mostly still discovering their preferences, while older ones have rarely had much choice or flexibility in their job focus, timing or location and therefore not likely considered their preferences. Employers can start by getting employees to understand more about their own strengths by having them do tests like StrengthsFinder and the Meyers Briggs Personality test. These are very helpful for enabling workers to discover their preferred type of work and environment, and whom they might work best with. In addition, they can consider if they work best in the morning or at night. Do they prefer to work at home or in a more structured environment? Do they like independent projects or team-based tasks? Gathering all these inputs, each employee can build a profile of their individual optimal work and conditions–including location(s) and schedule, accommodating non-corporate activities and obligations too. After some iteration, team members’ working profiles can be combined and compromises reached in order to maximize work situations as a team as well. New models and parameters are best trialed over a few months and tweaked to refine personal and team scenarios. The results in a compelling win-win that enhances individual and team performance, increasing focus, coordination, and engagement. 1MFWF: Your company Flexcel Network is based in a co-working space in New York. What advantages have you found coworking to have for your business? Sophie: Co-working environments reflect the Future-of-Work mindset. They allow for different types of company, jobs and people to find work venues and economic models that are formulated to suit their specific, desired culture, organizational design, and cost parameters. I selected Neuehouse where I feel well-aligned with my work setting—philosophically, physically, and mentally. It is therefore a very constructive environment for me to work in. Additionally, if I have a question about any kind of technology, business issue, or want to bounce ideas off someone, there are always people to talk to. I enjoy having the energy and camaraderie of people around me with different backgrounds and perspectives while working on my own terms, having my own business. In addition, I observe the dynamics of the setting that informs and expands my understanding of how work places and approaches are changing and the people who are choosing to populate these new environments. 1MFWF: Why do we need to embrace progress in the workplace? Sophie: We built the machines of the Industrial Age and housed them in stark structures. Workers then had to work along side them and were not treated much differently. As we focused on survival, we had limited understanding about what motivates people and believed monetary compensation linked to volume completion of tasks was sufficient. Now, we have much more data about the many different methods that can be utilized to incentivize individuals and teams, enabling them to be more productive and perform better. This encompasses personalized work situations, careers and benefits, enabled and supported by a digitally-enhanced and integrated workplace. Many existing or prospective employees will simply walk away from your company if there are no efforts to transition to new ways of working. They no longer feel obliged to work at a corporation that is still holding on to legacy habits and traditional employment concepts. At the same time, technology has accelerated the pace of business and organizational flexibility and responsiveness—that are enabled by these changes—are imperative to be successful. I believe a little melodrama is likely warranted: “evolve or die”. This is progress we must embrace. Congrats Sophie Wade. I love your insights. Thank you, Doreen. There is much change going on and it’s not easy for anyone!